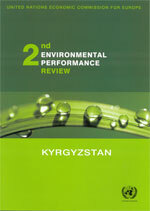 This is the second EPR of Kyrgyzstan published by ECE. The report takes stock of the progress made by Kyrgyzstan in the management of its environment since the country was first reviewed in 2000. It assesses the implementation of the recommendations in the first review (Annex I). It also covers nine issues of importance to Kyrgyzstan concerning policymaking, planning and implementation, the financing of environmental policies and projects, and the integration of environmental concerns into economic sectors, in particular water management, land management and biodiversity conservation and sustainable management of forests. The report places particular emphasis on the promotion of sustainable development, as the country gives a high priority to this issue. The review takes stock of progress made by Kyrgyzstan in the management of its environment since the country was first reviewed in 2000. It assesses the implementation of the recommendations in the first review (annex I). This second EPR also covers eight issues of importance to Kyrgyzstan related to policymaking, planning and implementation, the financing of environmental policies and projects, and the integration of environmental concerns into economic sectors, in particular the sustainable management and protection of water resources, land and biodiversity.